I made bread. Homemade bread from scratch. Yeast was involved. The only reason I make this homemade bread is because it fits into my present day criteria: Prep is less than 5 minutes and I can make the whole thing while holding a human. It is so easy. Once the dough sits in the fridge for one night, I can bake a single loaf of bread anytime I want in 30 minutes. Then my house smells like heaven, and I have warm bread that I slather with butter and honey. Don’t take my word for it. Read the original recipe here. The writer is much funnier and knowledgable than I am. 1. Pour three cups warm water into any large, resealable container. I used a large glass bowl that has a lid. Large tupperware works great too. 2. Add one and a half tablespoons salt. This photo is riveting, I know. 3. Add one and a half tablespoons of dry active yeast and stir until completely mixed. Wait about two minutes until the yeast starts to make little bubbles. Step 5: Loosely cover the bowl and let it sit out for 1-2 hours while it rises. We didn’t get any pictures of this part, because we were putting the kids to bed. After John and I watched a few TV shows, I squished the dough into the bowl because it started to balloon out. Then I sealed the lid tightly and threw it in the fridge. Step 7. Serve your hot, fresh bread to whatever lucky humans are near you. I ate it with tomato-bruschetta-mix for a light dinner. Add 1.5 tbsp active dry yeast and stir. Wait 2 minutes until you start to see tiny bubbles. Add in 6.5 cups of flour. Just dump it all in. And stir with your hands. Cover loosely and set aside for 1-2 hours while the dough rises. After dough rises, punch it down if needed and seal container tightly. Keep in the fridge overnight. Serve with absolutely anything and it will be delicious. I love it with butter and honey. Or bruschetta (recipe below.) Or with pulled pork. Mix ingredients together and serve on crispy bread. Enjoy! Sometimes it is great to indulge. Give into your wildest imagination. Make it a reality. One Monday afternoon, I thought, “I want shrimp. Fresh shrimp dipped in spicy sauce. AND I want juicy tomatoes on the side. WITH Burrata.” So I drove my crazy monkeys to the grocery store. I told them we were eating shrimp and the best-freaking-caprese-salad-in-the-world. Let’s take a moment to discuss Burrata. Imagine if Mozzarella and Cream Cheese had a fancy love child. It elevates. It seduces. It. Is. Burrata. We ate it. It was divine. Dinner still only lasted 5 minutes and it was very loud. But I got to eat my dream dinner on a Monday. Cheers to life! Skirt steak is one of my 15-minutes-or-less dinners. And let’s be honest, this is more of a “meal idea” than a recipe. The thin steak cooks up quickly, and the other raw ingredients are added to the plate. Dinner. Done. Weird quirk about me: I have a hard time chewing steak. Flank steak is delicious and fast, but it’s always too tough. I’ve had good luck with skirt steak. So if there are any other flat-toothed eaters out there, skirt steak might be your new food friend. 1. Heat oil (coconut/vegetable/etc) in a VERY hot cast iron pan. 2. Pat steak dry with a paper towel and give a very generous sprinkle of salt and pepper on both sides. Kid tip: if your child has zero molars they will have a hard time with steak :) I serve Baby Jack leftover salmon when we eat steak. This has become my favorite way to cook pasta. One pot, people! The pasta is cooked directly on top of the sausage and I use chicken broth instead of water. So creamy, without using any cream. It literally tastes like butter. 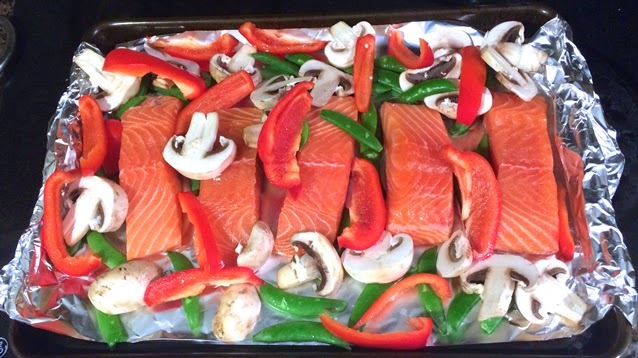 Then I roast some veggies on a tray in the oven and serve them on top at the last minute. In a large stock pot, brown the sausage over medium heat until cooked through completely. Add the raw pasta directly onto of the cooked sausage. I usually break it in half. Add 3-ish cups chicken broth and give a gentle stir (you want the majority of the pasta to be covered but not drowning/floating.) Put on high heat until the broth comes to a boil. Then put on low heat for 15 minutes with the pot lid on. On a foil-lined cookie sheet, spread raw veggies. Drizzle with vegetable oil or olive oil (i use both even though i know olive oil isn’t supposed to be used at high temperatures) and a generous sprinkle of salt and pepper. Roast at 400 for 20 minutes. Open the lid on the pasta. If there is still a lot of liquid, just take the lid off, give it a good stir and cook for 5 more minutes. If the pasta doesn’t taste done and there is no liquid left, then just add a little water and leave the lid on for 5 minutes. Serve creamy, sausage pasta with roasted veggies on top. I should have titled this “The Smoothie All Other Mom’s Knew About But Me.” Apparently spinach smoothies are a thing. I didn’t know! Where have I been!? My kids are pretty good eaters, but neither of them will eat any sort of leafy greens. I have tried putting spinach into spaghetti, NOPE! I have tried spinach in quesadillas, NOPE! But the second I say, “Let’s make smoothies!” they both come running/waddling/tripping. I have no idea who told me about this smoothie. If it was you, thank you! As with most things in the kitchen right now, they go better if Jack is not there. He is left out of the cooking action. I feel bad for about negative 2 seconds. Grace is pretty good about avoiding life-threatening activities, so she gets to help. She is giddy about shoving spinach into the blender. Now we’re talking! Step 1: Fill Blender about 3/4 full of spinach. Then dump roughly a cup of whatever yogurt you like (I use full-fat-creamy-vanilla yogurt). Blend this up together. If you add the frozen fruit now, the spinach turns to icy clumps. This is not good. Step 2: Dump in about 2 cups frozen berries on top of spinach/yogurt mixture. Blend it up. Done. So healthy! So good! And yes, I’m a weirdo, and I don’t have any kiddie cups. I give them smoothies in glass. They have broken. Whatever. Sometimes I tackle dishes over and over, and I can’t seem to get them right. A good Short Rib has been one of those dishes for me. At some point, I just gave up trying to do it fancy. I dumped a few things in a pot and put the heat lower than I ever thought safe for cooking meat. Several hours later, I realized I had cracked the code. I make these short ribs about once a week, because they are so easy. I don’t stray from this formula. But first, a few notes on the pot to use. The same pot is used to sear the meat on the stove and then braise it in the oven. You can use cast iron, enameled cast iron, stainless steel or a copper pot as long as it doesn’t have a wooden/plastic/synthetic handle. If your pot has a plastic/rubber handle it will melt in the oven. It will smell bad. You don’t want this to happen. You also want the pot to have a lid so you contain all the goodness while its cooking in the oven. So now that you have an oven-safe pot . . . Heat some oil until it is VERY hot. I test this by sprinkling a tiny bit of water when I think it is hot enough. If the water sizzles right away, you are ready to go. Give your short ribs a generous sprinkle of salt and pepper and put them in the hot oil. Seer short ribs on all sides. This might only take about 1 minute per side. This part is optional. Anything you put in will make these ribs better, but if you don’t put anything, they are still delicious. This particular day I sliced an onion and threw in about 6 whole garlic cloves (peeled). Everything gets so soft and juicy that big hunks of onion/garlic in the final dish are an awesome thing. I also chopped up the entire head of cilantro, stems included and threw them in (I must have taken this picture before I added the cilantro.) Good rule of thumb, if you are cooking the cilantro, you can use the stems. If you are just sprinkling it on top of a dish after it has cooked, only use the leaves. In the past I have thrown in a chopped pear after reading this post. I have also completely skipped this step, because the only thing I had in the house was a loaf of bread. I am very scientific about this step. This is exactly what I did: 2 glugs of red wine from the bottle I had open. 1 smaller glug of soy sauce. 1 more small glug of Worcestershire sauce. About 4 glugs of chicken stock (I like this kind but anything is fine.) Basically add liquid until your short ribs are covered about 50% with liquid. Then I put a lid on the pot, and put it in the oven at 275 degrees F for roughly 5 hours. This temperature is SO LOW and therefore SO FORGIVING. Five hours is what works with my schedule. If you needed to leave it in for 6 or 7 hours it would probably be just fine. If you needed to take it out at 4 hours because everyone is starving I bet it would be fine too. Open up the lid and take a fork to the ribs. You want them to fall apart when you pull at them. If they do that, they are ready! I served over rice and sprinkled a little bit of my extra cilantro on top. These would also be great over sweet potatoes. This is Baby Jack’s dinner plate. Braised short ribs are particular nice for humans without many teeth because the meat is SO tender. It shreds itself when they pick it up. 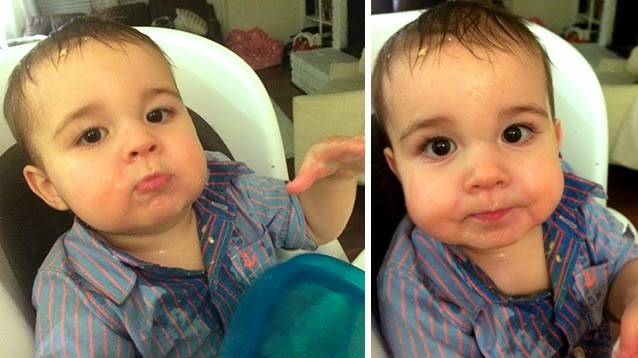 My least-foody friend gave me a tip that has changed my life: Babies love frozen peas. Just serve the peas straight from the freezer bag - no cooking required. Great for teething. Great for something fun to touch . . . ooooh so cold, but wait! So squishy. The peas melt in your mouth in about five seconds, so they are easy for babies to gum and eat. Both of my kids usually flip their shiesters about 10 minutes before I have dinner ready. What do I do with crazy monkies screaming for food? Give them frozen peas. And when they get old enough I give them a few different utensils with which they can battle the peas. Keeps them busy and contained. When they are so hungry they want to eat their arms off, they gleefully scarf down peas. Win Win Win x10. *** Disclaimer: I have zero medical background and I have no official opinion on when to start solids. In my personal experience, the frozen peas entered my daily arsenal around eight-months-ish. And yes, those are Christmas jammies in March. That’s how we roll. Hello? Any lingering readers out there? It has been about two years since my last post. 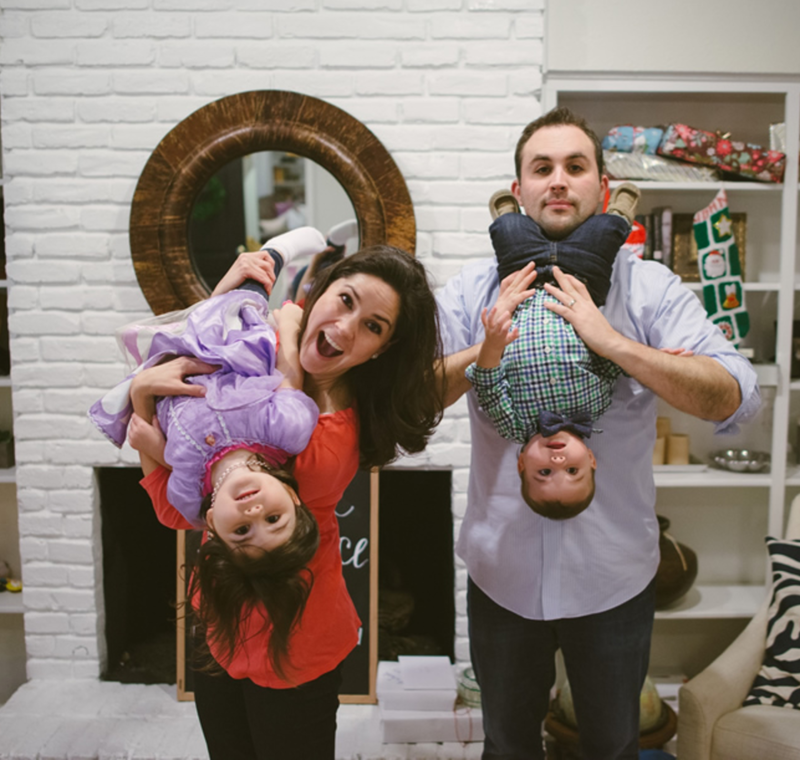 We have been swallowed whole by this amazing thing called Parenthood. We now have two kiddos. One daughter with a flair for the dramatic, and one son who basically functions as a laid back vacuum cleaner - scarfing down anything in front of him - edible or not. About once a week someone asks me: "Are you still cooking?" My quick and honest reply: "We eat a lot of peanut butter and jelly sandwiches. Who wants to read a blog about PBJs?" So this is my re-entry to the food-blogging world. I want to document our real-life dinners. Real life with small kids. Real life where I am usually holding a human while I cook. Real life where I have about 15 minutes to cook, and our family dinner lasts less than 5 minutes - start to finish. The pictures will be terrible. The recipes will be ingredients that can be quickly stacked together into a meal. And the writing will be filled with my honesty/love/frustration. First recipe below . . .
My tastes haven't changed in the last few years. I still love fish and veggies. I crave salmon almost every other day. I like it simple: seasoned with butter and salt. I wish I could say we only eat wild salmon. 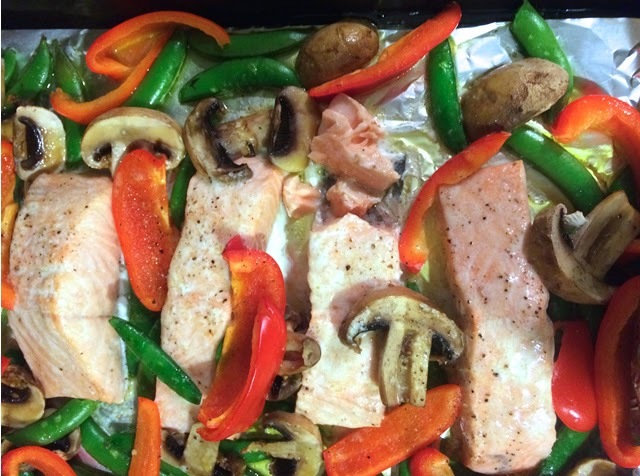 Unfortunately, my husband and I are crazy about the farm-raised Atlantic salmon they sell at Whole Foods. We buy it fresh and cook it no later than the next day. I'm writing this out mainly for my mother. Madre Mia, if you are reading . . . don't buy frozen fish. It will never taste good. 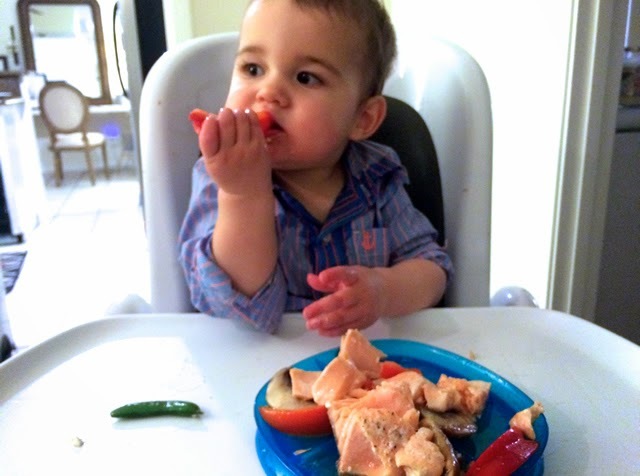 Happy coincidence, salmon is one of the only proteins my son can eat without any help. He has roughly 8 teeth, so pork chops are still a struggle :) But a fillet of salmon can be flaked in between his chubby fingers and gummed in his delicious mouth. Needless to say, we eat a lot of salmon. And the fewer dishes we have to wash the better. This dinner is prepared on one cookie sheet. I lined it with foil just to make clean-up even easier. Place fish fillets skin side down. Surround with any veggies you like: mushrooms, red peppers, sugar snap peas, etc. Melt some butter in a bowl (I do about 1 tbsp. butter per fillet of salmon because I don't like to scrimp on the delicious things in life.) Pour butter over the fish and veggies, and give it a VERY generous sprinkle of course kosher salt. Add some pepper if you like it. Bake at 400 degrees for about 12-15 minutes. A lot has happened in the last few months. Our baby girl is growing like crazy. Her cheeks are as big as ever and her thighs are extra squishy. Her cuteness (and sleeplessness) has kept us from posting any of our cooking adventures. But we're going to get better. We also moved into a new home. It is awesome, but the awesome-est part of all is that we inherited a garden. mint! basil! eggplant! jalapenos! and the star of today's post . . . SAGE! sweet sweet sage that begs to be put in a pot of browning butter. Honestly, you could pour this brown butter sage sauce over anything and it will make you want to lick it like a cake batter bowl. But we served it over sweet potatoes, and we are never going back. 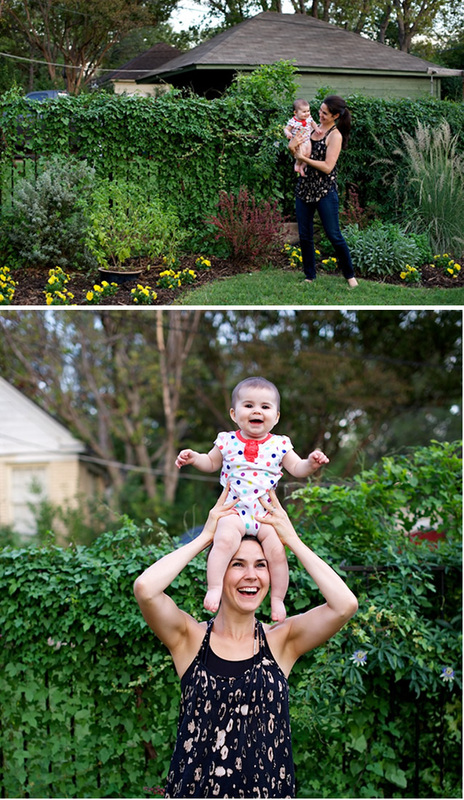 and a little look at our growing nugget and the garden . . . we have the privilege of tending to them both. 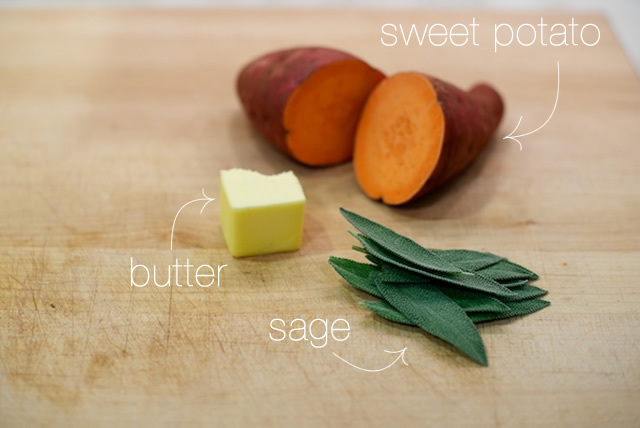 The process is simple: slice the sweet potatoes with skin and all into 1/2 inch rings. Roast them with a little olive oil and salt for about 40 minutes at 400 degrees. Meanwhile melt butter in a sauce pan until it starts to turn brown. Then remove butter from heat and add chopped sage. 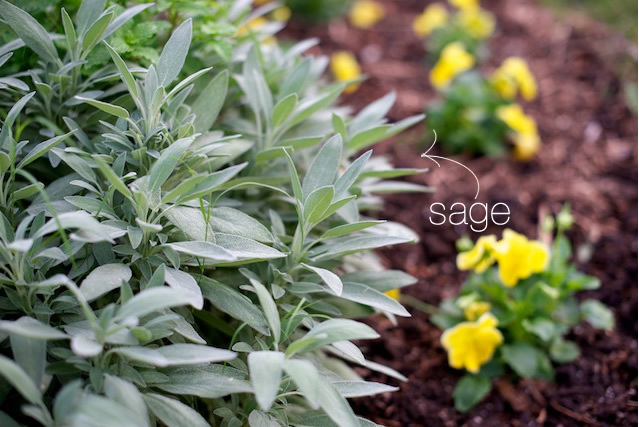 The sage will basically fry in the heat and your kitchen will start to smell like heaven. 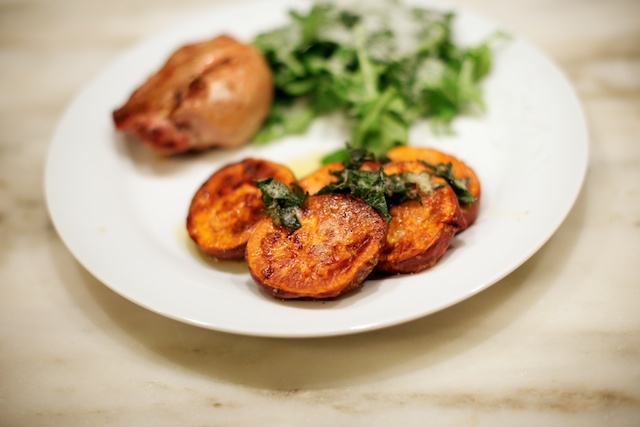 Serve sweet potatoes and spoon brown butter sage sauce on top. We enjoyed these guys with some grilled chicken thighs and an arugula salad. Put sweet potatoes in oven and roast for 20 minutes, flip once, then roast for 20 more minutes. Melt butter in small sauce pan. When butter starts to turn a light brown color, remove from heat and add sage leaves. The heavenly mixture will bubble and the leaves will start to crisp. This is incredible. 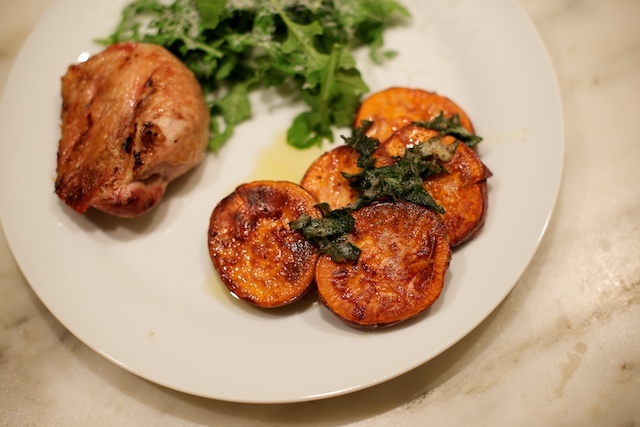 Spoon brown butter sage sauce over sweet potatoes and enjoy!